This article was written By Mike Olivarez on 22 Apr 2011, and is filed under Uncategorized. Mike Olivarez hails from Southern California, and fancies himself a walking, growing pain. A remnant of the analog era's last generation, and a former gofer for the anime man, he continues to struggle to make sense of the media absurd. Mike is the blogmaster of both The Wandering Kaijyu & Cel Count Media, as well as contributor to Anime Diet. Shimonoseki is not the first place most people visit in Japan. Nor, truth be told, is it the 5th or 6th, or even 10th. A slim city that hugs the rocks of the southern tip of Japan’s main island, Honshuu, like a moss, Shimonoseki is often overlooked for the very good reason that no one has ever heard of it. But for the Japanese film fan, this sleepy city offers an opportunity to get close to a young man who sang his sightless heart out to ghosts every night and lost his ears in the process. Kwaidan, the 1964 omnibus horror film directed by Kobayashi Masaki, as its centerpiece, has a story about a young blind monk named Hoichi, who lived in Shimonoseki and was something of a virtuoso on the biwa, the Japanese lute. One night he was invited to play for a retinue of lords, who had heard of his abilities. He is asked to sing about the battle of Dan-no-ura, which took place in the straits of Kanmon that separate Honshuu and Kyushuu to the south, in which the Genji clan defeated the Heike. Hoichi being blind, he has no idea that the august lords for whom he is singing night after night are in fact ghosts of the fallen Heike. In case you haven’t seen the film I won’t give away exactly how Hoichi gets his name but suffice it to say he and the ghosts don’t part on the best of terms. 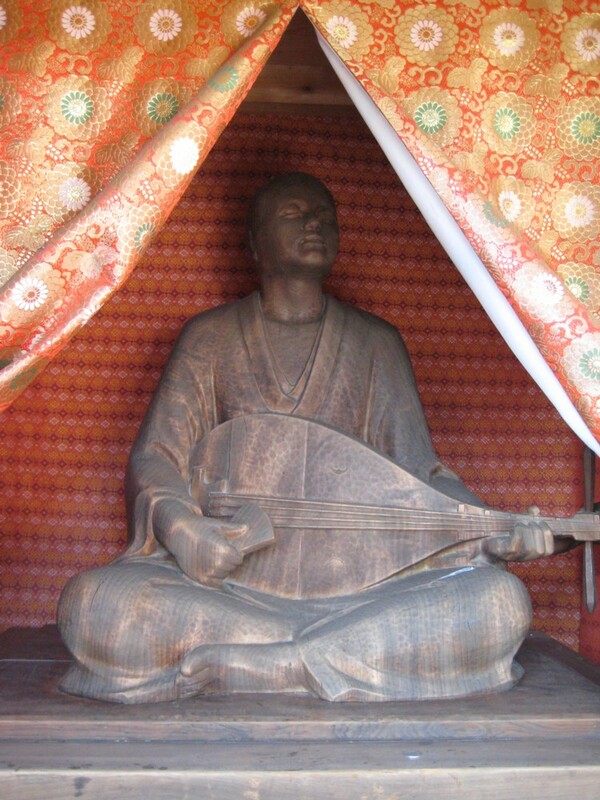 The wooden statue of Hoichi can be found to the left of the main hall. Hoichi sits inside a small wooden shrine, which is covered with paper talismans and decorated with strings of origami paper cranes. 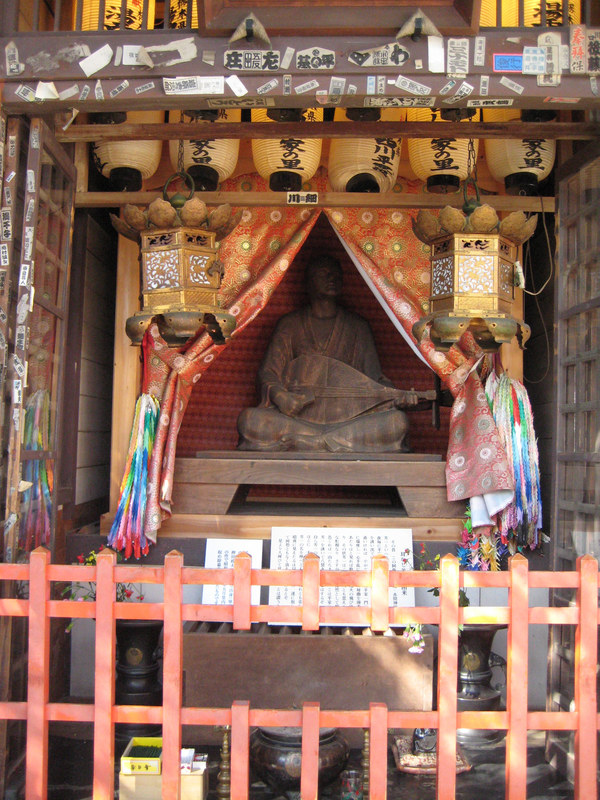 Golden orange curtains are parted, revealing a sitting Hoichi, his head cocked to one side, the biwa forever soundless in his lap. It’s more than slightly surreal to see Hoichi made physical like this, as if he were a real person who happened to hang out with ghosts. But it’s this incongruity that gives the shrine such power. The emperor Antoku was very real. For many people, the story of Hoichi has been told so many times he may as well be real as well. Why make a distinction? Both are alive for us now and for many, Hoichi even more so. After all, I made a pilgrimage here to see a statue of a fictional character that I knew from a film, bypassing the shrine of a person who really did exist. So tell me, who is more real? 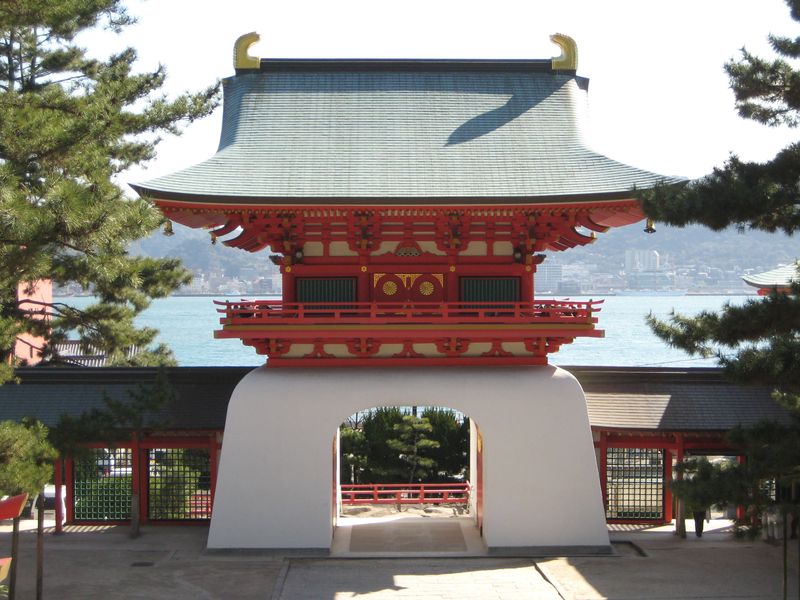 Most of what Shimonoseki has to offer can be seen in two days. The Karato Port area, where Akama-jingu is located, has the usual tourist attractions like an aquarium and souvenir shops. This is also where you can catch a ferry to Ganryu Island, where Miyamoto Musashi fought his last duel (written about here). Further down route 9 is what’s left of the samurai town of Chofu, which has some impressive old homes and temples. Fans of Japanese history, particularly the Meiji Restoration, will enjoy walking around this area.